I took a break last week from tomatolandia to deal with a stash of peaches. I had visions of peach hand pies that were quickly squashed by the 106º temperatures, so a small batch of peach jam it was. I omitted the cinnamon and nutmeg from Marisa McClennan’s Food in Jars recipe so that I would have something that would work as well in some iced tea (with a squeeze of lemon) as it would in a bowl of oatmeal come December. Success. 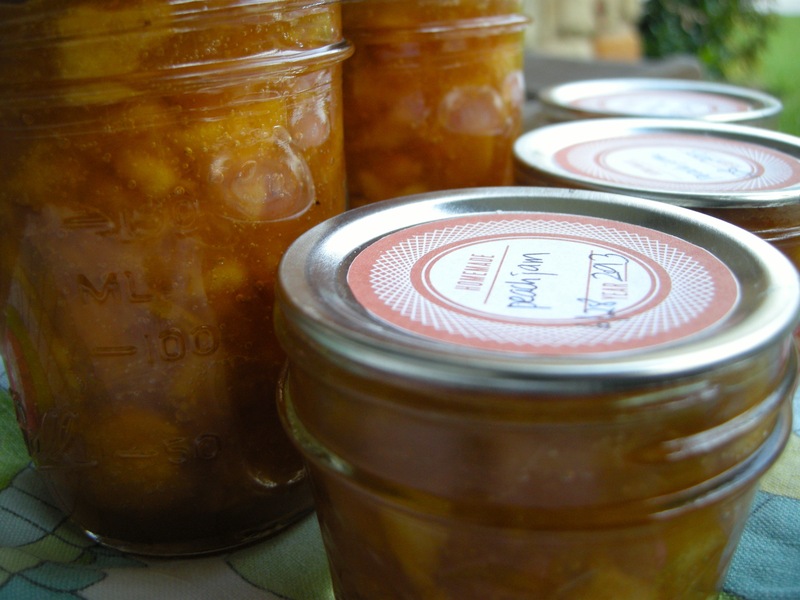 My canning adventures started a little over two years ago in Kate Payne’s kitchen. I think it was figs? That day, my daughter and I helped her prep fruit and mostly observed as she quickly turned a batch of fresh fruit into neat little jars of preserves. I was sold. Her ease and comfort at what seemed like a daunting process made it all seem so doable… reasonable even. I now keep a stock of homemade pantry items – tomatoes, ketchup, applesauce, pear sauce, pear butter, pickled red onions, and even little bits of sweet preserves. They help carry the bright taste of the seasons into our kitchen throughout the year and our little Austin family has completely changed its approach to the pantry. I feel more confident than ever with a pot of boiling water bubbling at my side and think of her every time I walk past my stash of jars, beaming with pride. Thank you, Kate! Kate offers wonderful preserving classes year-round that I would definitely suggest if you are thinking about taking on water-bath canning. You can also check out Hip Girl’s Guide to Homemaking (the book and blog) in between so you can stay up to date on her latest kitchen tricks. What a sweet post. A very belated you’re welcome and a thank you right back atcha!